Two Heavyweight Champions, One Discover Single. 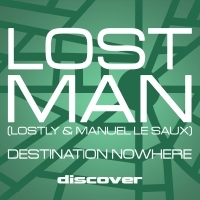 Lostly and Manuel Le Saux join forces as 'Lost Man' and together they now unleash 'Destination Nowhere', their third single on Discover Records. 'Destination Nowhere' is a bruiser of a track, it's got bass with a punch and a gigantic euphoric riff which will surely uppercut this original into the Trance charts. 'Destination Nowhere' is available now from Beatport and iTunes.